When Mack's parents send him his friend's ashes, his biggest concerns are coming to terms with his relationship with his friend, and finding the most appropriate location to spread his ashes. But then a ragtag group of misfit criminals shows up searching for the lottery ticket one of them hid in the urn. He soon finds himself teamed up with a former waitress who is trying to elude an Elvis impersonator as they try to figure out what this oddball group wants. Add to the story a domesticated pig who's been set free in the desert and you have what can only be described as a screwball comedy that will keep you entertained from the first page to the last! 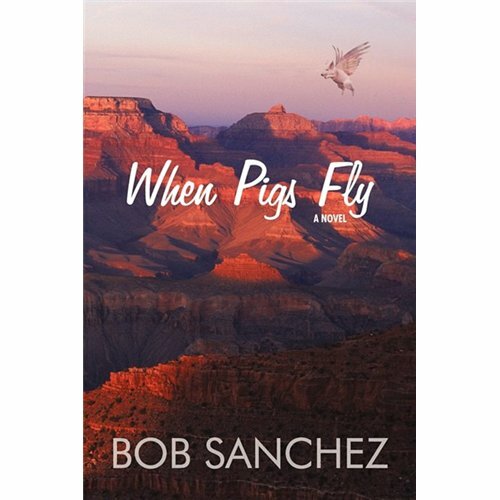 I heard about When Pigs Fly by Bob Sanchez more than a year ago, but I just finally got around to reading it. It was as funny, and crazy, as I had expected. The storyline is fun, but the characters are what really make the book great. Sanchez has created a cast of characters that is truly outrageous, but somehow he manages to make them seem real. For example, there's Diet Cola, the huge, smelly, bully who thinks with his stomach. And then there are Frosty and Ace, brothers who remind me of the characters in the Dumb and Dumber movies. And of course, there's Elvis and Poindexter, the javelina. I thoroughly enjoyed this book. If you're looking for something different, something that will make you laugh out loud at the crazy antics of a bunch of bumbling fools, I definitely recommend When Pigs Fly. Every one of the supporting characters is unique and interesting, and the storyline keeps you moving from beginning to end. This review was written based on an e-book copy of When Pigs Fly that I purchased. This one sounds good, too!